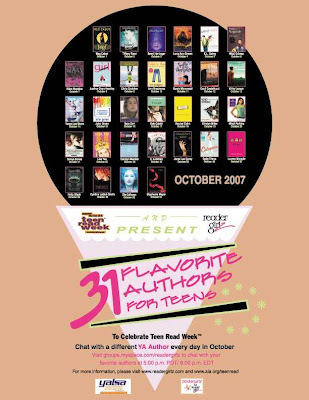 Ananka's Diary: Chat with Your Favorite Authors! Thats SO cool. So is the statue. To add you to that blog i need an email adress, the one for your blog. I will delete it after I see it, and I promise not to email you! You really are a master of disguise. I never know when it's you! I'm going to chat on October 19th!!! Yep. I'll post a button so you can join from this site! NOOOOOOOO!!!!!!! Why do you have to be 14 to have a myspace account? I'm not old enough! SPRING, INTERNATIONAL MASTERMIND, AND ALL OF YOU WORRIED ABOUT A MYSPACE ACCOUNT . . . I'm going to try to find out if there's a way to log in to the chats without signing up for myspace! thanx anaka- you're awesome! hope i can chat! i've been away the whole summer doing cool stuffs. post about that stuff and more soon! gahhhh! i've read 202 pages of "the empress's tomb. it's great!! !